We love their Croissants since. 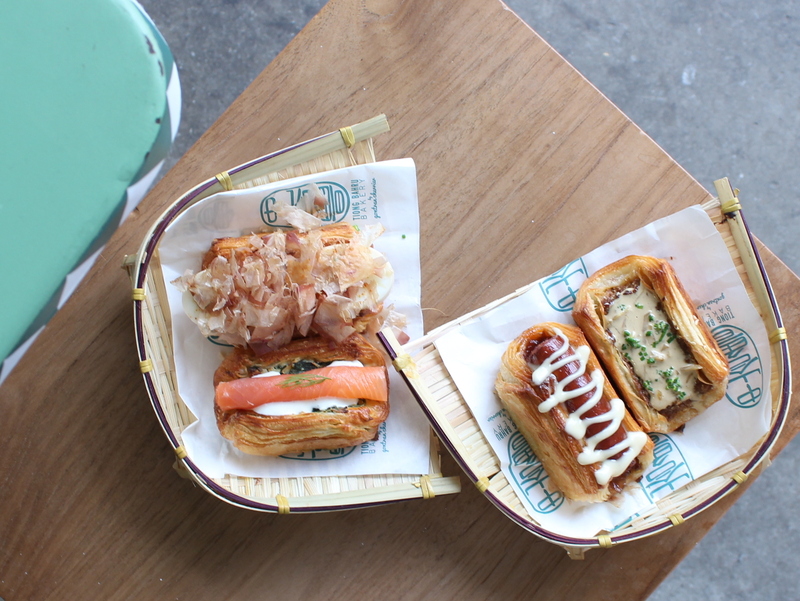 And to our delight, Tiong Bahru Bakery just launched their latest Savoury Croissants! The first two of the savoury croissants are the American-favourite Flying Pig (Pork Sausage wth Onion) and the Oriental-classic Rolling Dumpling (Xiao Long Bao fillings)! Quite frankly, while I usually love my sausages, this TBB’s rendition was a true foodgasm! The onion relish and the miso dressing, together with TBB’s crusty croissant, made Flying Pig my top choice amongst the savoury items. Another interesting option is the Japanese-inspired Running Egg (Ramen eggs topped with bonito flakes, right). While the eggs can be argued to be more runny, the combination of flavours here worked well. Another dependable option, the Norwegian-caught Jumping Fish (Salmon). This is definitely a safe option, but I will rather you try the more daring flavours TBB is putting out there. At $4.50 each, you can pick any of the 2 savoury croissants together with the salad for a $12 set making this a hearty and quick lunch.